In simple terms, the law may be understood as the systematic set of universally accepted rules and regulation created by an appropriate authority such as government, which may be regional, national, international, etc. It is used to govern the action and behavior of the members and can be enforced, by imposing penalties. 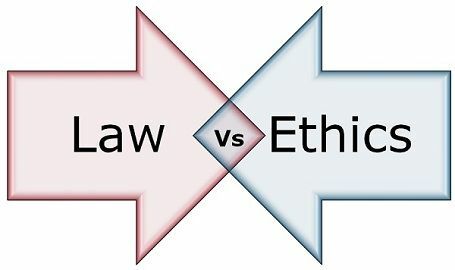 Many times the term law is juxtaposed with the term ethics, but there is a difference, as ethics are the principles that guide a person or society, created to decide what is good or bad, right or wrong, in a given situation. It regulates a person’s behavior or conduct and helps an individual in living a good life, by applying the moral rules and guidelines. For a layman, these two terms are same, but the fact is that there is a difference between law and ethics. Read the article carefully, to overcome your ambiguities. Meaning The law refers to a systematic body of rules that governs the whole society and the actions of its individual members. Ethics is a branch of moral philosophy that guides people about the basic human conduct. Expression Expressed and published in writing. They are abstract. Violation Violation of law is not permissible which may result in punishment like imprisonment or fine or both. There is no punishment for violation of ethics. Objective Law is created with an intent to maintain social order and peace in the society and provide protection to all the citizens. Ethics are made to help people to decide what is right or wrong and how to act. Binding Law has a legal binding. Ethics do not have a binding nature. The law is described as the set of rules and regulation, created by the government to govern the whole society. The law is universally accepted, recognized and enforced. It is created with the purpose of maintaining social order, peace, justice in the society and to provide protection to the general public and safeguard their interest. It is made after considering ethical principles and moral values. The law is made by the judicial system of the country. Every person in the country is bound to follow the law. It clearly defines what a person must or must not do. So, in the case of the breach of law may result in the punishment or penalty or sometimes both. By ethics, we mean that branch of moral philosophy that guides people about what is good or bad. It is a collection of fundamental concepts and principles of an ideal human character. The principles help us in making decisions regarding, what is right or wrong. It informs us about how to act in a particular situation and make a judgment to make better choices for ourselves. Ethics are the code of conduct agreed and adopted by the people. It sets a standard of how a person should live and interact with other people. The law is defined as the systematic body of rules that governs the whole society and the actions of its individual members. Ethics means the science of a standard human conduct. The law consists of a set of rules and regulations, whereas Ethics comprises of guidelines and principles that inform people about how to live or how to behave in a particular situation. The law is created by the Government, which may be local, regional, national or international. On the other hand, ethics are governed by an individual, legal or professional norms, i.e. workplace ethics, environmental ethics and so on. The law is expressed in the constitution in a written form. As opposed to ethics, it cannot be found in writing form. The breach of law may result in punishment or penalty, or both which is not in the case of breach of ethics. The objective of the law is to maintain social order and peace within the nation and protection to all the citizens. Unlike, ethics that are the code of conduct that helps a person to decide what is right or wrong and how to act. The law creates a legal binding, but ethics has no such binding on the people. Law and ethics are different in a manner that what a person must do and what a person should do. The former is universally accepted while the latter is ideal human conduct, agreed upon by most of the people. Although, both the law and ethics are made in alignment so that they do not contradict each other. Both go side by side, as they provide how to act in a particular manner. Every person is equal in the eyes of law and ethics, i.e. nobody is superior or inferior. Further, these two allow a person to think freely and choose. Literature was very informative and easy to understand. Thank you, Keydifferences.com ! Very Cool! Thank you, Keydifferneces.com. Your explanation was very precise and easy to understand.